This incredibly moist and rich chocolate mayonnaise cake is adapted from Jill O’Connor’s wonderful cookbook, Cake, I Love You. 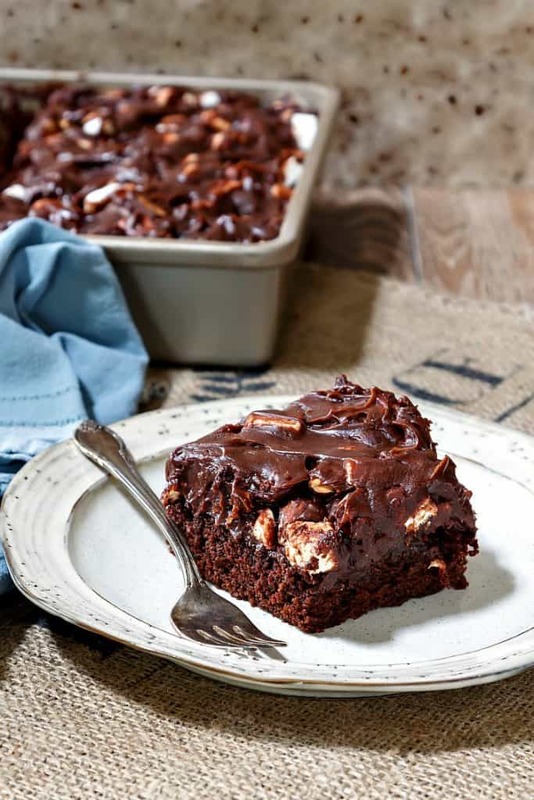 You’re going to love the texture and chew of the rocky road frosting! Jill O’Connor is one of my favorite people in the world. 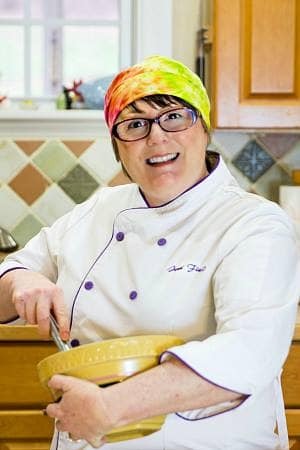 Not only does she write swoony cookbooks and a column for the San Diego Union-Tribune AND give talks to the Culinary Historians of San Diego AND appear on Home & Family, she is also Very, Very hilarious and a wonderful person. I love her. And I love cake. So when Jill’s most recent book, Cake, I Love You, came out (it’s now celebrating its first birthday! ), I needed to own it and bake from it. 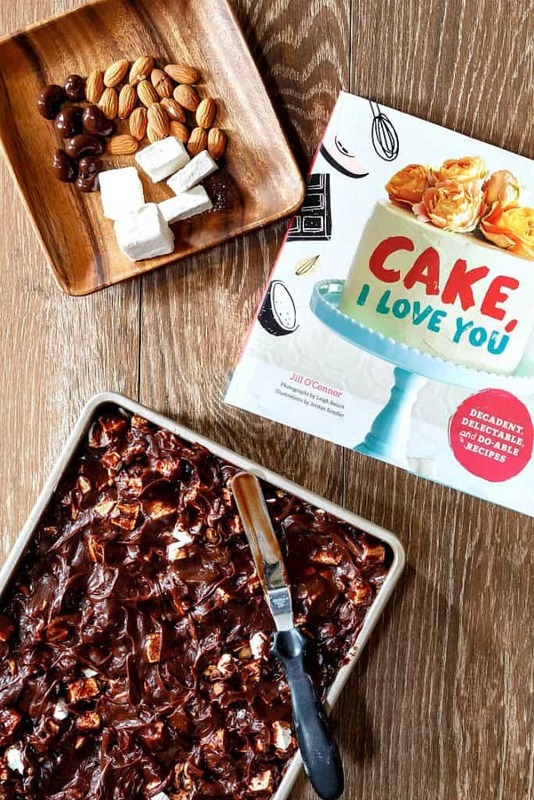 This mayonnaise cake recipe with rocky road frosting is a spin I put on her wonderful Chocolate Mayonnaise Cake with Melted Chocolate Bar Frosting from Cake, I Love You. There are no melted chocolate bars in the recipe, but the frosting does taste quite like a melted candy bar. Luscious, rich, and shiny. Perfect. So of course the Rocky Roadness is just gilding the lily. But if you are a fan of gilded lilies, you’ll want to try my version with toasted, chopped nuts and mini marshmallows. You can watch Jill demonstrate how to make her Old-Fashioned Chocolate Mayonnaise Cake with Melted Candy Bar Frosting on Home & Family here. Much like desperation pies (Lord, we’re out of fruit, and I need pie. Let’s see what’s in the cupboard), mayonnaise cake was born of the desperation of Depression Era in the United States. Butter was hard to come by, so ingenious bakers subbed in mayonnaise, which is pretty much just oil with a little egg, some vinegar, and salt. Even mayonnaise companies jumped on the mayo cake bandwagon and started printing the recipe right on the jar. Today, Hellman’s has a very fine chocolate mayonnaise recipe printed on their website. Check the salt level of the mayonnaise you are planning to use. If it is pretty salty, you may have to add minimal, if any, additional salt. Let your palate be your guide, and know that chocolate mayonnaise cake is incredibly moist, delicious, and easy to make. The ingredients for chocolate mayonnaise cake are pretty straightforward. The only surprise is the mayo, and even that shouldn’t surprise you since it’s in the name of the cake! Scale out your dry ingredients. 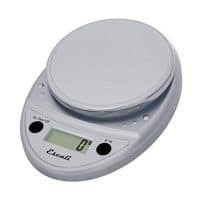 You will want a kitchen scale for this. Trust me–it makes your life much easier. Weigh the flour and cocoa powder. You can use measuring spoons to measure the small amounts of salt and leavening. Sift together your dry ingredients. I like to use a regular mesh strainer for this. No need to buy a dedicated sifter unless you really want one. I sifted the ingredients together twice to get them fairly evenly combined. Weigh out your sugar. For the rest, a liquid measure will do just fine for the water. You’ll also need 2 eggs, vanilla, and instant coffee or espresso powder. And the secret ingredient to keep things moist and wonderful: mayonnaise! 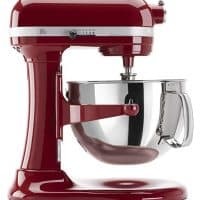 Place sugar and eggs in the bowl of your stand mixer. Fit it with the paddle attachment and beat on medium high speed for about 5 minutes. You’re looking for the ribbon stage. The mixture will be light in color and relatively thick. See how it looks when it falls off the beater? Ribbon. Because you’re using a fair amount of sugar and relatively little liquid (in the egg whites), not all the sugar will be dissolved at this point. That’s okay. Beat in the mayo and vanilla until smooth. Alternate adding the sifted dry ingredients with the hot water/instant coffee or espresso powder. Add about 1/3 of the dry followed by half the wet, half of the remaining dry, the rest of the wet, and end with dry. 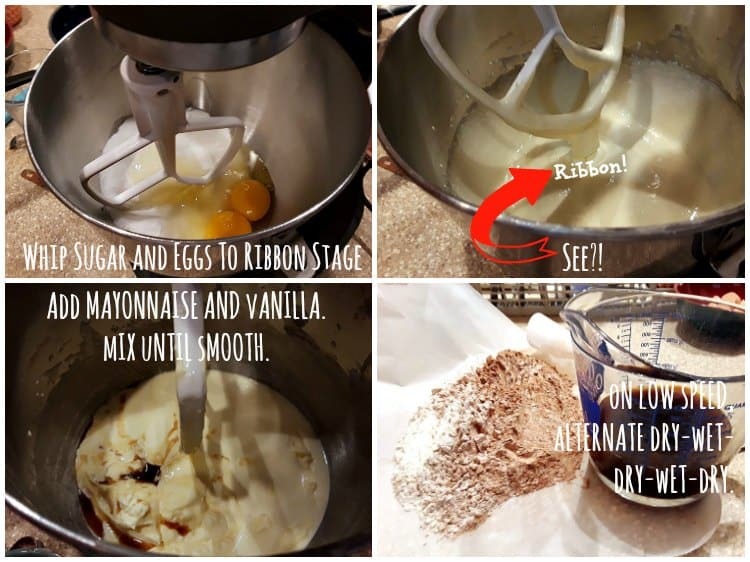 Be sure to scrape down around the sides and the bottom of the bowl with a large, flexible silicone spatula a couple of times during these additions to keep the mixture uniform. The next collage doesn’t show steps, but it does show the texture of the batter and what you’re looking for when the mayonnaise cake is fully baked. Notice the baked cake is no longer shiny, is well-risen, and pulls away from the sides of the pan just slightly. I shoot for an internal temperature of 195F to 200F, and yes, I check the temperature with an instant read thermometer. The frosting is easy to make, and as a bonus, you don’t need a mixer at all. 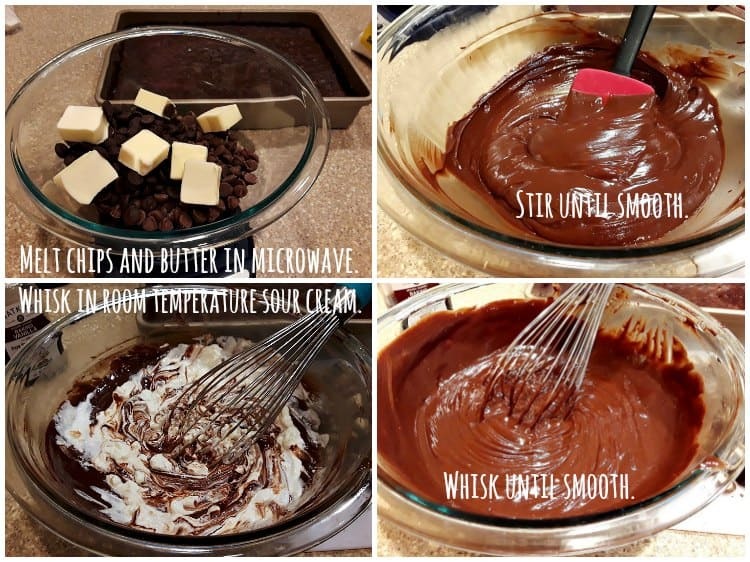 Put the milk and dark chocolate chips, along with the stick of butter, in a microwave-safe bowl. Melt in bursts and then stir until completely smooth. Whisk in room temperature sour cream. Keep whisking until the mixture is smooth. Sift the powdered sugar into the frosting. Fold in about 2/3 of your marshmallows and chopped nuts. Spread half the frosting on the cake. Scatter the reserved mini marshmallows and chopped nuts evenly over the cake. Add the rest of the frosting in “blobs” evenly spaced over the mallows and nuts. Spread/swirl. You want some mallows and nuts to still be showing. NOTE: Store the cake in the refrigerator. It’ll help firm up the frosting a bit and make the cake easier to slice. Slice the cake while chilled, but let the slices sit out for about 30-45 minutes before serving so they come back to room temperature. This is a pretty straightforward cake to make. You don’t have to make homemade marshmallows. If you’d like to, though, here is the recipe for the mallows. Rather than spreading in a round pan, I spread the mallow mixture onto a prepared half sheet pan. 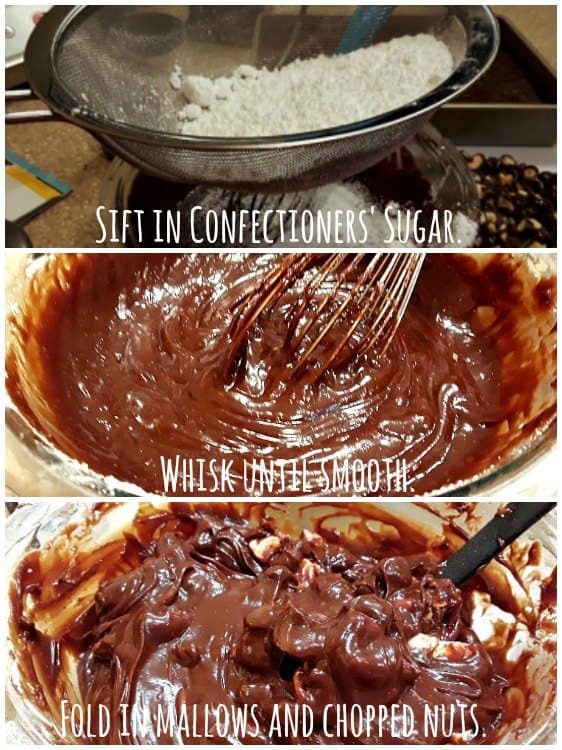 If you’d like the frosting to be a bit thicker (especially if you plan on leaving out the rocky road part), beat with a hand mixer or stand mixer. This will incorporate some air, lighten the texture to make it easier to spread, and give you the perfect slice of chocolate sheet cake. As easy as this cake is to make, you could potentially run into some issues. I’ll try to answer any questions you have before you get started. If you have other questions, please don’t hesitate to email me or leave a comment on this post. Should I use Dutch process cocoa to make this cake? No. 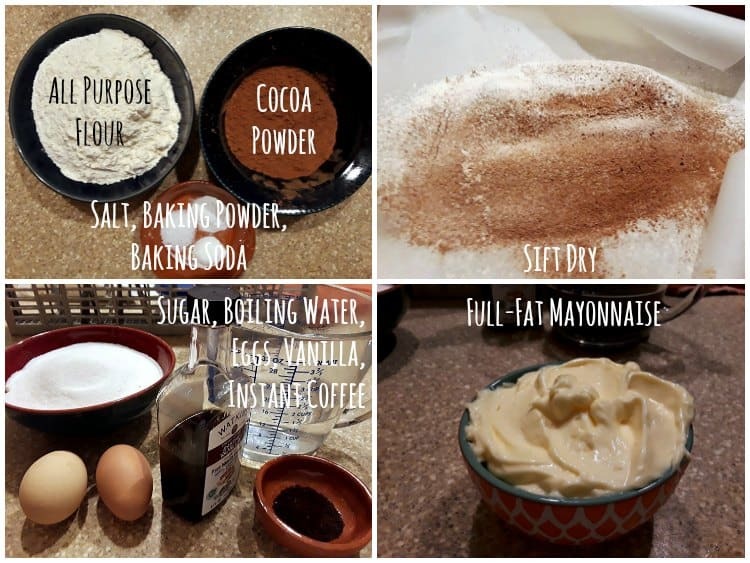 Use American-style cocoa powder. It’s lighter and more red in color than Dutch process or alkalized cocoa powder. Dutch process means that the cocoa powder has been treated with an alkali to neutralize the pH. American style cocoa powder is slightly acidic, and the baking soda is in the recipe to neutralize it. If you use Dutch process cocoa and keep the baking soda, your cake will taste a bit soapy, which is no good at all. I don’t have instant coffee or espresso powder, and I don’t want to order it. What can I use instead? No problem. Just use hot brewed coffee, and you’ll be fine. Can I substitute sour cream for the mayonnaise? No. Sour cream is mainly dairy, and mayonnaise is mainly oil. You will not get good results using sour cream–there is not enough fat in it to make the cake nice and moist. Can I use a hand mixer to make this cake? You can, but your results might not be quite as good. You really need the power of a stand mixer to achieve a nice ribbon stage in the step where you beat the sugar and eggs together. You can’t really achieve the desired result with a hand mixer. 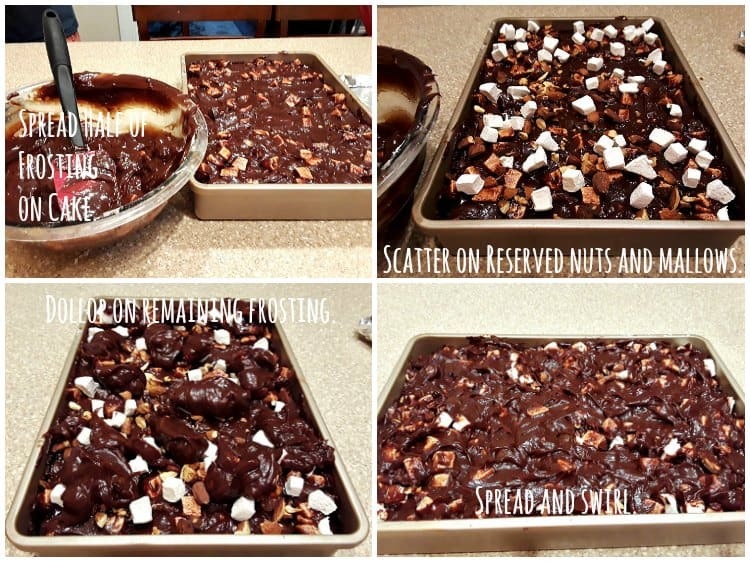 What kind of nuts should I use in the rocky road frosting? And can I leave them out if I don’t like nuts? I used a combination of chopped chocolate covered cashews and toasted almonds. You can use whatever nuts you prefer. Hazelnuts, pecans, or peanuts would work nicely too. And you can use a mixture of your favorite nuts as well. You don’t have to add nuts or marshmallows to the frosting at all. Jill’s original recipe contains neither marshmallows or nuts, so it’s totally your call. Can I make this into a layer cake? Yes! Jill’s original recipe gives directions for making this cake in round pans. 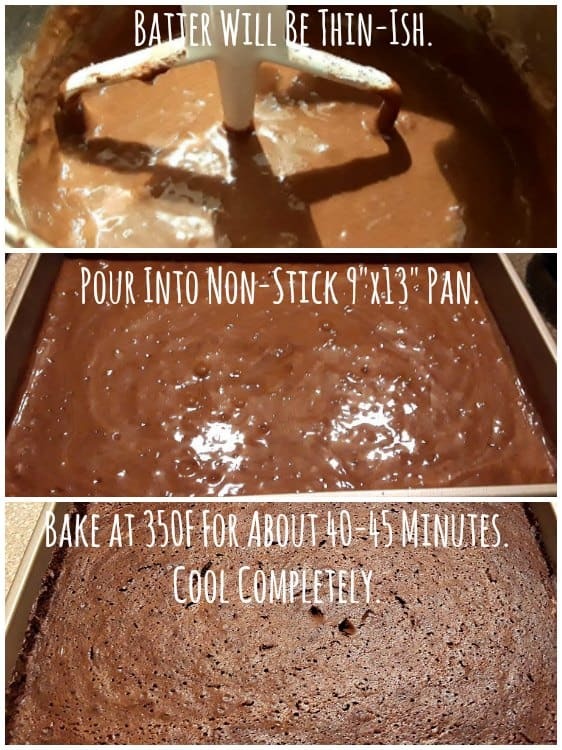 Divide the batter evenly between the two pans, and bake for 20-25 minutes. Is the cake hard to slice with all those nuts in it? I would probably not make the rocky road frosting if making a layer cake. The cake is hard to slice cleanly when you hit a nut, so having nuts both in the filling between the layers, around the side, and on the top is a recipe for a very messy slicing experience. 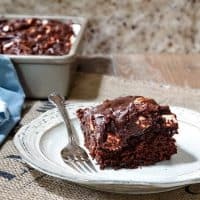 If you still want to make the rocky road frosting, I’d slice the cake first and then just add the mallows and chopped nuts to the top of each slice. If you are looking for more cake recipes, I can help. Try these great cakes on for size! And don’t forget to take a look at Jill’s wonderful Cake, I Love You. If you like the sound of this recipe, please rate it and/or leave a comment for me. I love hearing from you! And if you make this recipe, please share a photo! Tag me on Instagram at @onlinepastrychef with hashtag #pcorecipe! This moist and rich chocolate mayonnaise cake boasts a thick layer of chocolate sour cream frosting with "rocky road" mix-ins--homemade mini marshmallows and chopped nuts. This is a great cake for a picnic, a pot luck, or to serve for dessert on any day. Easy dessert recipe to make, and even easier to eat! 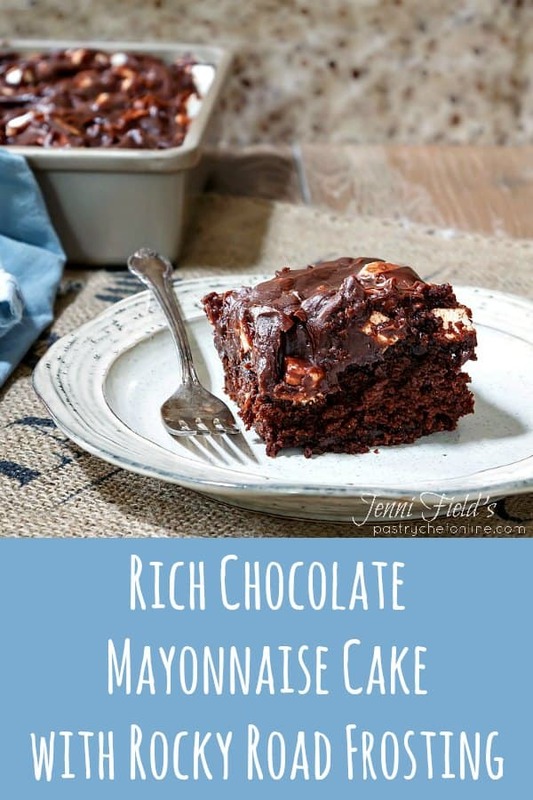 Find the original recipe for chocolate mayonnaise cake with melted chocolate bar frosting in Jill O'Connor's wonderful (affiliate) Cake, I Love You. Position your oven rack in the center of the oven. Preheat to 350F. 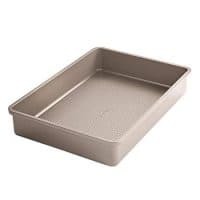 Spray a 9"x13" rectangular cake pan with pan spray. Set aside. Sift together the flour, cocoa powder, baking powder, baking soda, and salt. Set aside. Stir the espresso powder into the boiling water. In the bowl of your stand mixer fitted with the paddle attachment, beat the sugar and eggs on medium high speed until they reach the ribbon stage, about 5 minutes. Add the mayonnaise and vanilla and beat until smooth, scraping the bowl as necessary. With the mixer on low speed, alternate adding the sifted dry ingredients in three additions with the coffee in two additions. Begin and end with the dry ingredients. Scrape bowl as necessary. Scrape the batter into the prepared pan and bake for 40-45 minutes or until the cake springs back when pressed in the center, the edges are just starting to shrink from the sides of the pan, and the internal temperature of the cake is between 190F and 200F. Measure out the sour cream and allow to warm up from refrigerator temperature to cool room temperature, about an hour. Put the semisweet chips, milk chocolate chips, and butter in a microwave safe bowl. Microwave on full power for 1 minute. Stir the chocolate and butter until completely smooth. If it's not all melted evenly, heat in 15 second bursts, stirring in between, until completely smooth. Whisk in the sour cream until completely incorporated and smooth. Whisk in the salt and vanilla. Put the confectioners' sugar in a fine mesh strainer and sift it onto the chocolate mixture. Whisk until smooth and shiny. Fold in about 2/3 of the chopped nuts and mini marshmallows. With an offset spatula, evenly spread about half the frosting onto the cooled cake. Scatter the remaining toasted nuts and mini marshmallows evenly over the frosting. Dollop on the rest of the frosting. Then use your spatula to swirl and spread the frosting over the nuts and mallows, leaving some of them showing. Refrigerate the cake until serving time, at least 2 hours. Slice the cake and let slices come to room temperature before serving. Store leftover cake, covered, in the fridge for up to 3 days. And there you have it, a rich, moist, and crowd-pleasing old-fashioned chocolate mayonnaise cake. Make it with my rocky road frosting or leave out the mallows and nuts to stay true to Jill’s original recipe. Either way, you’re going to love this cake. I promise. Thanks for spending some time with me today. And I really do love hearing from you, so please leave a comment, rate the recipe, and/or ask a question. I’m happy to help. good grief, woman, I’m drooling all over my keyboard. This sounds absolutely decadent and I think I MUST find a reason to make it. Let’s see, tomorrow is Tuesday, that may be a good enough reason. I actually do have somewhat of a question. You say that you can use brewed coffee in place of the instant or espresso. How much brewed coffee would you use, and wouldn’t that mess up your liquid to solids ratio? Use the same amount as the water: 1 1/3 cups. 🙂 Then just leave out the water and the espresso powder. And Tuesday seems like the perfect reason to make this! This is a great, moist chocolaty delight. A nice treat that is not heavy like some chocolate desserts can be. Definitely worth saving room for! OMG I cried a little…recipes like this make me wish I could eat gluten. You outdid yourself with this one! I hope you can make it happen with a gf blend of some sort. It’s such a mosit, rich cake. While 8 can take credit for the marshmallows and nuts, Jill Oconnor gets full marks for this cake and especially for the frosting. It is seriously the best chocolate frosting I’ve ever had! I just want a whole pan of this to myself – that’s a serving right? Great instructions and love the frosting for it. You can have as much as you want! And the frosting is just the best. Jill O’Connor is a cake genius!